Team JFAUK have just returned from the 2019 WJF Miyazaki International Cup held in Thessaloniki, Greece. A superb trip saw the team win 3 Gold, 5 Silver and 3 Bronze medals. Find out what happened by reading on. Starting the competition was JFAUK’s Veteran Judoka hailing from Scotland, Japan Baird in the Veterans -79kg category. Coming into this event Jason was hungry to fill the one hole in his medal collection – international gold. Starting the day Jason made short work of his category, meeting a rival Bulgarian Judoka in the final. 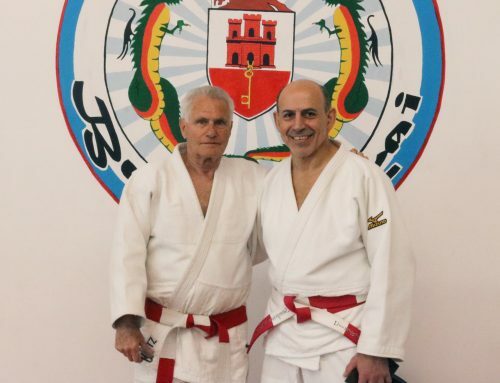 After a startling first exchange which saw Jason spin out of a quick drop seoi nage by the Bulgarian, Jason quickly transitioned into his trademark ne-waza and worked at the shime waza until his opponent tapped to secure Jason’s maiden international gold medal. Not satisfied with just one gold, Jason later entered the veterans open category. Driven by the newfound taste of first place, he continued his fine form, claiming ipppon after ippon to take home his second international gold. -66kg Judoka Alex charalambous stepped up next for JFAUK. Working his way into the final he dispatched of Bulgarian and Greek opponents with clean ippon judo before facing another Greek Judoka in the final. After a strong start from Alex which saw Alex in control of the contest, a controversial ippon score left Alex with a bittersweet silver medal. Fionn Rowan flew the flag for JFAUK next in the men’s -71kg category. 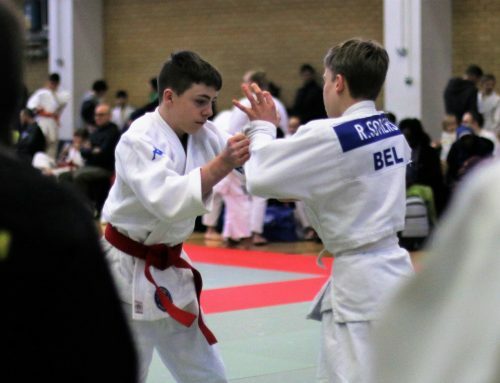 Following on from Alex’s performance he made short work of his Greek opponents with lightning fast counter techniques in the opening rounds before facing a Bulgarian Judoka in the final bracket. One mistake was all it took to leave Fionn with a silver medal. However, still a superb result for his international debut. w him against Algerian, Bulgarian and Romanian Judoka in the opening round of pools. Following a well fought win against an extremely tall Algerian Judoka, two consecutive losses unfortunately saw Alexis exit the tournament. However, Alexis still put on an extremely strong performance in one of the hardest categories he has faced in competition to date. JFAUK debutant Lucian Buleandra headed into the men’s -79kg event next. A similarly challenging category saw Lucian truly tested in the opening pools. However, 2 wins against Bulgarian and Greek Judoka was all it took to bring him through to the knockouts. Unfortunately a loss in the semi final knocked him into the repechage; where he had to face a Bulgarian Judoka for the bronze medal. Refusing to go home empty handed, Lucian dominated his opponent to take home Bronze at his maiden WJF event. Sam Sampson stepped up next in the also well supported men’s -83kg category. Coming top of his opening pool against Bulgarian and Algerian Judoka, Sam confidently headed into the semi final. A hard fought fight saw Sam eventually take the win before face his long standing Bulgarian rival yet again. In an extremely technical final, it was the Bulgarian who edged the win this time around to leave Sam with the silver medal. Still hungry for more, Sam later entered the men’s openweight event. A challenging bracket saw Sam face off against three heavyweight Bulgarian Judoka, however, a series of calculated fights enabled Sam to top the category, claim the gold medal and the mens openweight trophy. Next was up and coming JFAUK Judoka Sacha McClean in the Kyu grade -91kg category. A specialist in ne-waza, Sasha made light work of his opponents with swift shime-waza before facing an experienced Bulgarian opponent in the final. Despite a very close first exchange, experience eventually proved to be the deciding factor and Sacha left his first WJF event with a silver medal round his neck. Mikey Barton headed into the Dan grade -91kg category facing very experienced Judoka in his first WJF event. A promising first fight saw Mikey defeat a Greek Judoka with a thunderous Maki Komi and hungry for more. However, experience yet again proved to be the deciding factor and Mikey left the event with a bronze medal. JFAUK regular Hannah Chesham stepped up next in the women’s -78kg category. Battling through an extremely heavy chest infection, Hannah persevered through her first fight against a Greek Judoka to take the win. Unfortunately, the illness meant Hannah had nothing left in the tank and in the interest of her safety, she was withdrawn from the following contests and handed a bronze medal for her efforts. JFAUK para-athlete Karl Summerbell was up next, bravely stepping into the able bodied -71kg mid Kyu category. An extremely valiant effort from Karl saw him take on a number of opponents in a series of well fought fights. However, The extra power enabled Karl’s opponents to just edge the wins against him. Regardless of a medal, Karl still left the event with a large round of applause and his held high in recognition of his bravery anddesire to break boundaries and lead the way for JFAUK’s disadvantaged athletes. The final Judoka of the day was JFAUK’s Ross Elliot who took on the men’s -100kg event, one of the hardest categories of the day. Ross started his day on his usual form, defeating Greek Judoka with his trademark ashi waza and ne-waza, eventually finding himself against a Bulgarian Judoka in the final. An extremely close and tactful contest saw Ross take an early lead. However, in the dying seconds of the fight, a last minute ne-waza exchange saw the Bulgarian Judoka score ippon and leave Ross with a silver medal to close out the day. A valiant effort from all our Judoka, each of whom took on challenging categories and truly represented JFAUK well. 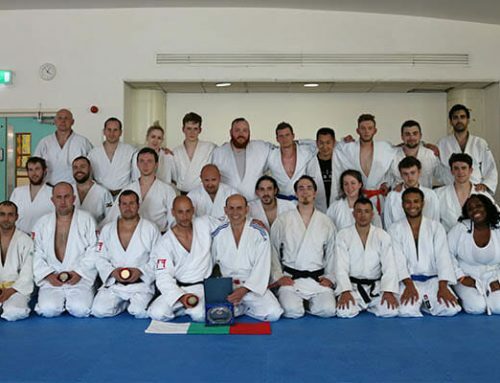 The day following the tournament, a training seminar between the Algerian, Greek and British Judoka took place. Supporting the team was JFAUK President and Chairman of the WJF referee committee, Sampson Sampson and WJF international referee Samuel Betu. 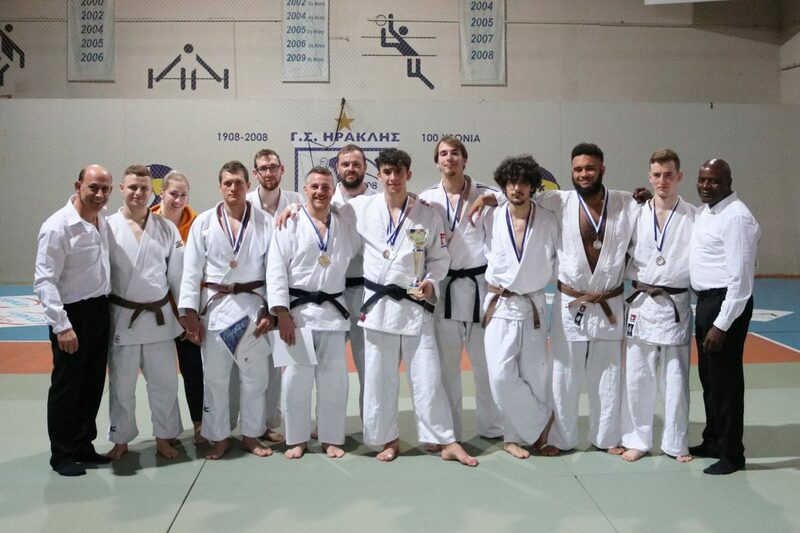 Next, JFAUK will be heading to Bulgaria for an exchange and team competition before heading back to Thessaloniki in June to the Matsuura international cup!